The third section of the walk starts with a sharp climb up Knocknahillion over rough ground (Cnoc na hUilleann on MC). By now you will know that this is the usual pattern, however by this time on the walk you would probably be getting tired and would notice just how sharp and how rough. The route shown does not go to the summit of Knocknahillion as it is off the main line of the ridge. Beyond Knocknahillion you twist and turn on the ridge as you make your way to Letterbreckaun (Binn Bhriocáin on MC). Knocknahillion and the ridge to Letterbreckaun. Photos in panorama: 1993. 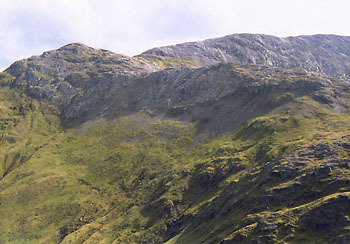 The view includes all of the high ground of the third section and even some of the fourth section of the walk, notably the final ascent at the extreme right. Map acknowledgement. The route shown on the map goes from bottom right to top left. The ridge between Knocknahillion and Letterbreckaun is fairly straightforward to navigate. It is possible to go slightly to the left of the route in green to get to the first pond shown, however there is a risk of missing the pond, particularly in bad weather. If you didn't know its shape, finding the summit of Letterbreckaun can have its difficulties. 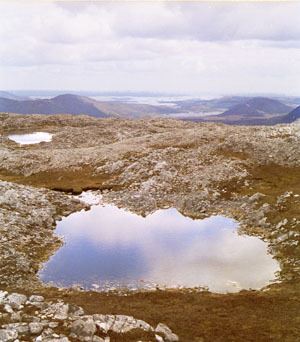 To quote David Herman in HWCM 'Hill Walkers Connemara and Mayo': "There are at least three competing cairns on the summit of Letterbreckaun. The cairn on the main summit is backed by steep, rocky ground to its south-west. It's reassuring to find this cairn because the next leg is demanding navigationally." As you arrive on the plateau, keep on your bearing and avoid the obvious looking high ground to your right. It isn't the top. On a good day the views in all directions are excellent. The picture shows an eastern view. Some of the features are identified in the next graphic. When leaving Letterbreckaun be aware that many people take a wrong turning or get confused at this point. Partly this is because of the hairpin nature of the turn, and partly because of the flat then convex nature of the summit, with extremely large quartzite blocks everywhere. Tips: In mist, make sure you are on the correct summit. Get the correct bearings and timings to leave, and stick to them. Avoid going on the NE ridge (named Binn on MC). Summit of Letterbreckaun. Photo 1996. Be grateful if you can see a view as good as or better than this (or indeed see anything at all). Identification of view on previous photo. Looking back at the ridge off Letterbreckaun. Photo: 1993. A picture of the descent from Letterbreckaun. There is an interesting change in the underlying rock here, from the quartzite of all of the preceeding walk to softer rocks for the remainder. The immediate and obvious effect is that there is deep bog on the softer rocks and this starts within metres of the change. Point A on the map above marks the point on the route where the change occurs. The rest of the route is not noticeably less steep for all this change, it is just that the steep parts have grass on them rather than bare rock. The picture below shows the whole descent from the highest point, Letterbreckaun over two apparent bumpy whitish tops to the very sharp col at Maam Turk (Mám Tuirc on MC). The bumpy top nearer to the col is in fact a ridge stretching towards the camera (see SE of point A on the map section above). To the left of the col is Maumturkmore in the Northern Turks and the rest of the walk, which is described in the next section. Note the extreme gradient of the start of the next section. From "The Illustrated Maamturks Walk"